Pigface will be playing a one day only show this year. 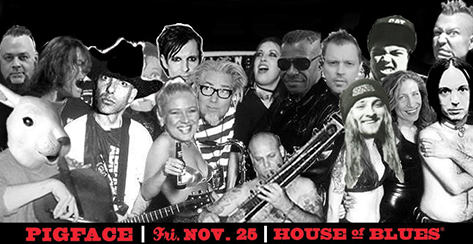 What we know so far is that it’s going to be at House of Blues Chicago on November 25th (Black Friday fittingly). Band leader and event organizer, Martin Atkins is promising this will be the WILDEST LINE UP EVER! It marks the bands 25th anniversary (also fitting for the date). Choose the combination of sizes. Includes $13 ticketmaster fee. no refunds. US only. Gen Adm tix are available July 1st from HOB at $45 each. The first size shirt you choose will be the Pigface logo shirt – the other will be a random, awesome Pigface shirt!